← Is it ok to call someone a nutjob because you disagree with their politics? This is just a quick follow-up post, to update you on things since yesterday’s about Chris Packham’s mental health problems and Asperger’s syndrome being used to attack him by the hunting fraternity. Packham was asked for his views on the matter by the Huffington Post and in typical fashion responded in a sober, mature way. Hunting Solutions is now been trolled by equally offensive vegans and animals rights activists. This is par for the course – I have also been trolled on twitter by vegan animal rights people. Someone insightfully suggested yesterday that hunt supporters and vegan animal rights activists feed off their mutual hatred – in a mutual dance of death. It’s an unedifying sight and will not solve anything. Hunting Solutions, far from recognising the offence they have given to a large proportion of the population, sought to defend their actions by claiming that because Packham called fox hunters psychopaths, he was, literally, “fair game” and called him a “nutter”. Now whether you agree with him or not, it is a reasoned argument, and he’s not calling Foxhunters psychopaths, but calling Foxhunting psychopathic – there is a big difference. A difference that will fly high over the heads of people like Connor. While the Countryside Alliance’s famously spiky Chief Exec Tim Bonner declined to get involved, their head of shooting Liam Stokes dropped a comment in to the twitter conversation yesterday. The petitioners relates to Packhams support for Mark Avery’s “ban driven grouse shooting” petition, which has now gained 36,669 signatures – that’s about 5000 added since yesterday – mostly I would imagine thanks to their own attack on Packham. Stokes also appears to think attacking Packham for his Aspergers and Depression is the “petitioners” fault for having dared to suggest that driven grouse shooting was wrong. If a shooter had shot Packham dead would Stokes have nodded and sagely pointed out that if he hadn’t supported the petition in the first place, he would still have been alive? Some commentators, who I respect, suggest the answer is to find the common ground and work with local communities, regardless of what their impact on nature is.This is undoubtedly an important approach to adopt, and the impact of farming on nature is a good example where this approach can help. But I’m not at all convinced it can apply to something like driven Grouse Shooting, which has as much to do with the politics of land ownership and property rights, as it does to do with the custom and practice of rural communities. Would the Suffragettes have successfully gained Votes for Women by seeking to find common ground with men who would do anything to prevent their gaining suffrage? Would the Slavery abolitionists have succeeded if they had agreed to sit down and agree a common-ground approach to abolition? Clearly not. Common-ground approaches have their place, of course, but not every issue can be resolved this way. This entry was posted in Chris Packham, hunting, Mark Avery, mental health and tagged Chris Packham, hunting solutions, Mental health, nicholas soames, nutjob. Bookmark the permalink. Excellent follow up piece. I would take your reasoning re the comments about foxhunting being psychopathic a small step further and say that for true equivalence between the remarks Packham would have to labelled not just foxhunters as a group (which as you point out he did not) but an individual named foxhunter as a psychopath. As for the ‘if he hadn’t criticised us we would not have said it’ “defense”, that is simply another example of a favourite tactic of these kind of people – victim blaming. Well said. That members of the hunting fraternity would attack someone’s views by citing their Aspergers and depression as making them a ‘nut job’ is loathsome indeed. Chris Packham has acted with nothing but dignity and, as ever, the unpleasant comments have backfired on those who made them. If anything it has just served to bring the debate about grouse hunting etc to a wider percentage of the population. Thanks, Miles, for this insightful and well reasoned piece. You make an excellent point about suffragists and abolitionists – however, it’s worth noting that these amazing and successful campaigns may have changed laws but they did not end racism or sexism, the attitudes that drove them. Time and time again, the moment I see feminism ‘click’ for men is via empathic and respectful relationships with women, and certainly, it is through connecting to and listening to people of colour than I’ve come to question my own assumptions and beliefs. Jonathan Haidt’s book ‘The Righteous Mind: Why Good People are Divided by Politics and Religion’ is excellent on the reasons why relationships of trust are so effective in this way, and I recommend it highly. One other point. While the comment made about Chris is vile and should rightly be condemned, the slur was against him – and he has responded to it. He doesn’t need defending, as he is an adult with plenty of agency and a platform to make whatever points he wishes. There is a danger that the slur is being used to ‘make hay’ and score points in what’s already a horribly entrenched conservation conflict, and I’m not sure what the net gain of that is. thanks Melissa. These are all excellent points. I am conscious of the risk that a bandwagon is created, and am trying to avoid either jumping on it, or giving it a push, hence my comments about the animals rights brigade trolls. I think it’s worth noting the glee with which the Hunting Solutions person appears to be experiencing as a result of this issue. Inicidentally, I have a copy of the Righteous Mind which I am looking forward to reading. Another very well written and well reasoned blog. The Hunting Solutions people are obviously vile, I could understand putting something on Twitter in haste (as Nicholas Soames probably did) I can’t understand stoking the flames thereafter! I do find the problem with incidents like these is it takes the debate away from the core of the argument and focuses it on personalities. Would driven grouse shooting be better if Chris Packham did it? Although I don’t agree with all of Mark Avery’s opinions and I do think there is a conservation world away from grouse however he is a very, very clever man with his moves planned months and moves in advance, I am amazed by some people stupidly taking him on when his weight is the prime thrust in their debate. Deluded fools! thanks Mark. Yes it is unedifying to watch members of the hunting fraternity and their opposite numbers tear pieces out of each other, at least metaphorically on social media. It does nothing to move the debate forward. Mark Avery is indeed well seasoned in the tactics of campaigning, though I am sure there are those on the hunting side with equal or equivalent skills. To me the key point is – is it appropriate to label people as mentally ill in order to make political points. If it isn’t ok for Hunting Solutions to do it then it clearly isn’t ok for Chris Packham to do it. I’m not sure whether such labels are directed at individuals or groups is especially relevant. If I tried to make an argument about driven grouse shooting (whether for or against) on the basis of sexual orientation, gender or race would it be appropriate? I think there is a pretty clear distinction between the two. Packham was saying that he believed that the activity of fox hunting (or any other activity which involves killing for pleasure) had a psychopathic element. Now you can disagree as to whether this is true or not, but it’s not a term of abuse. 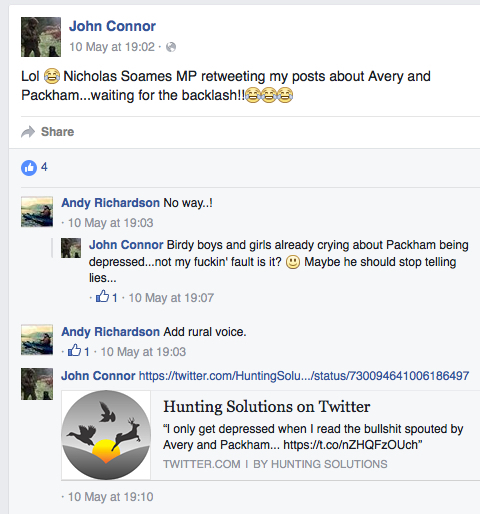 Hunting Solutions were exploiting Packham’s mental health problems and Asperger’s, to abuse him. No problem Miles whether or not there is a distinction both comments are clearly using mental health labels in a derogatory way. Maybe that would become clearer if we took a less “acceptable” form of bigotry and a less controversial activity – say someone said “birdwatching is a gay activity” – would that be that different from saying “birdwatchers are gay” – I don’t think so – and it would be wrong on two counts firstly there’s nothing wrong with being gay but it is implying there is and then applying the “insult” to an entire group of people. But yes – shock horror someone has been nasty to someone else on twitter! I’m regularly called a pervert a psycho and an animal abuser because I campaign for non lethal wildlife management. None of this has much to do with animal welfare or conservation it’s just spite. – I feel we could all agree that it’s pretty clear in this quote that he is calling people psychopathic not just an activity. I think we’re getting into the realms of semantics here. But it’s interesting that Packham changed the language he used in the Guardian piece, compared with the language in this Indy piece a year earlier. That may have been deliberate. Or of course he may have been misquoted. I think what Packham is pointing out is that there is a clear link between people who hurt or kill animals for pleasure, and people who have a psychopathic disorder. I would be interesting to know whether there is any research into the proportion of people who exhibit psychopathic behaviour and who enjoy hunting for pleasure, relative to the rest of the population. On the issue of “killing for pleasure” I sometimes wonder if it is a little over rated. I think many conservationists would accept that in some contexts animals do need to be lethally controlled. Two examples that Chris Packham has given are Mink and Deer. To me the criteria to judge whether or not killing animals is right are the “humaneness” of the deed and the ecological need. That an animal is killed for pleasure might make the activity less savory but I’m not sure it has much moral consequence. For example if someone were to kill a rare species in a way that made it suffer that would be infinitely worse (in my opinion) than if they were to kill an invasive species in a way that caused it huge suffering. If they happened not to enjoy the former act and to enjoy the latter that wouldn’t effect the morality of either killing IMO. I’d have thought the “sporting” aspect of an act of killing animals whether or not it is linked with mental illness ranks pretty low when compared with any other aspect. In fact in a way if we actually preffered more cruel but less “sporting” killing we’d just be putting our own emotive reaction above the interests of the animal killed and the environment. It’s funny how we confer sainthood on top of celebrity status. Packham comes across as a follower, and not a leader. Others had shown him first that it was not career suicide to stick his neck out. As much as he is lauded as a communicator, why is he a witting accomplice to the “biocultural” diversity of where he lives? Where is his support for those who question the damage being done to wild nature by the agri-environment subsidised over-grazing of the New Forest, and by the devastation of the “river restoration” there – no, can’t call it that – the “flood prevention” that somehow is being carried out by the Forestry Commission, when it should not be in receipt of European funds? How helpful a communicator is Packham when one of his series of promotional/informational videos for “Rewilding“ Britain sees a future of European bison in our woodland, “knocking down trees, creating clearings” even though there is no archaeozoological evidence of their presence here in the Holocene? I hope you would agree, Miles, that criticism of Packham is not now off-limits, just because a few people took advantage of personal revelations from him in his autobiography? thanks Mark. I am very happy for people to criticize Packham’s views on things, whether they be related to rewilding or not. What isn’t acceptable (in my book) is ad hom attacks on his mental health or position on the autistic spectrum. He’s written multiple articles on this, since you made this comment. Who is he ‘following’ there?